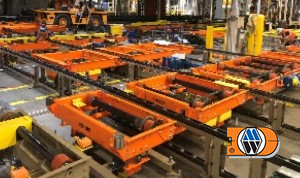 A power and free (P&F) conveyor consists of a continuously-moving powered chain, which when engaged, moves a free (non-powered) load-carrying trolley through the conveyor system. The powered chains are typically drop-forged rivet less – link type (such as X-458 or X-678). In a P&F conveyor system, force is applied to the free load-carrying trolley via a retractable dog, which is integral to the front free trolley. This retractable dog engages a dog which is integral to the power chain. Power is then transmitted to the free trolley. The retractable dog on the free trolley can be engaged and disengaged through the use of a blade-type stop mechanism, or by the mechanical reaction of the load carrying trolley accumulating on a trailing trolley in the free track. 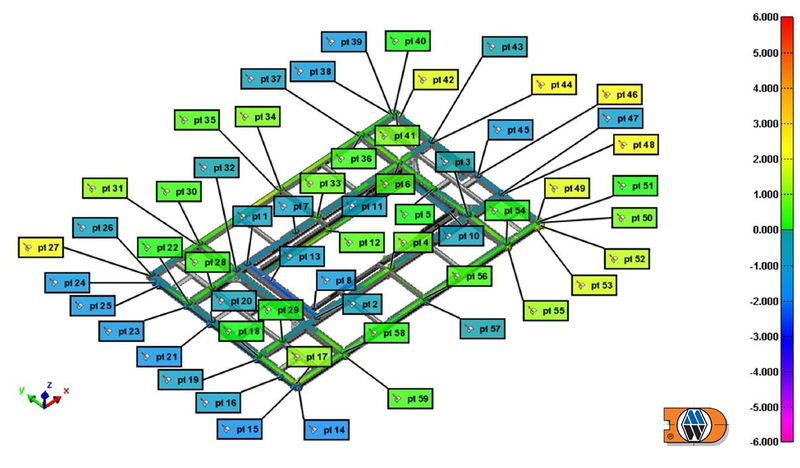 A typical carrier arrangement is supported by two or more free trolleys using pivoting, load-bearing kingpins. The trolley that leads is the front (accumulation) trolley. The rear or trailing trolley is equipped with a ramp or beaver tail that provides the means to begin the accumulation process in accumulation cell. 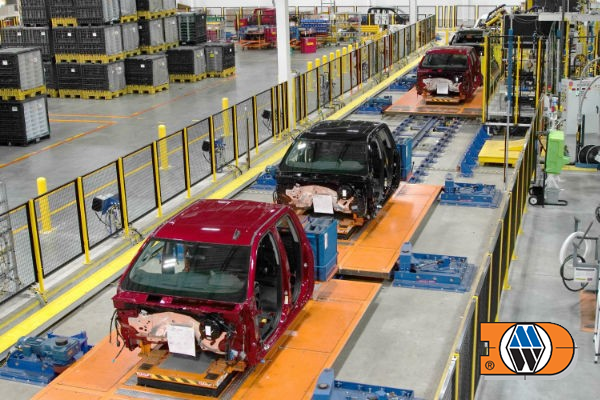 Move product through production areas on specific job centers. 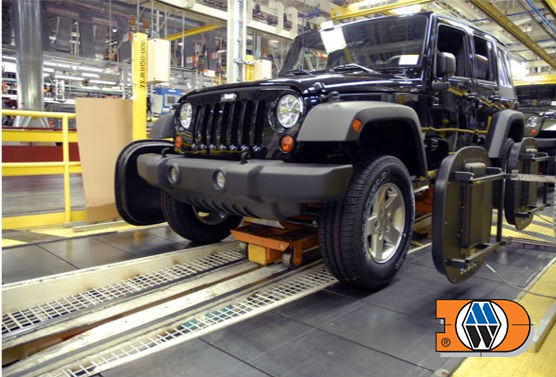 Stop in place for load and unload operations. Accumulate loaded and empty carriers for high-density storage. Speed changes as required to maintain a specific production rate or to create buffer zones. The P&F conveyor design offers considerable flexibility in layout. 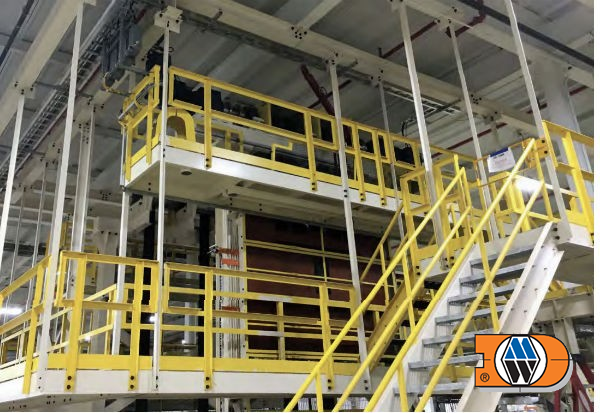 These systems can be designed to move a product in a simple monoplane loop or they can carry products through a variety of elevations and complex layout configurations. They easily accommodate extreme changes in elevation, which can help to maximize use of floor space. 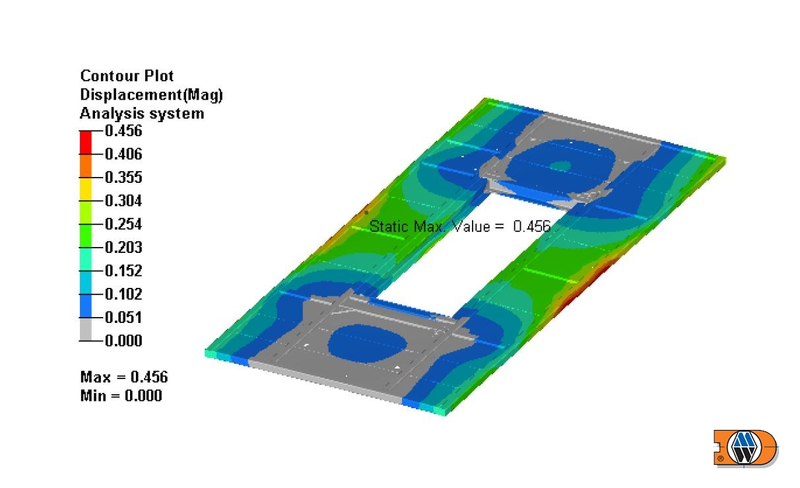 P&F systems offer a wide range of load capacities, sizes, and operating speeds. Speeds range from extremely slow, 1-2 ft (0.3-0.6 m)/min, up to 60 ft (18.3 m)/min and higher for special transfer applications. The ability of P&F conveyors to accommodate load-carrying free trolleys on minimal centers provides a great degree of system flexibility. 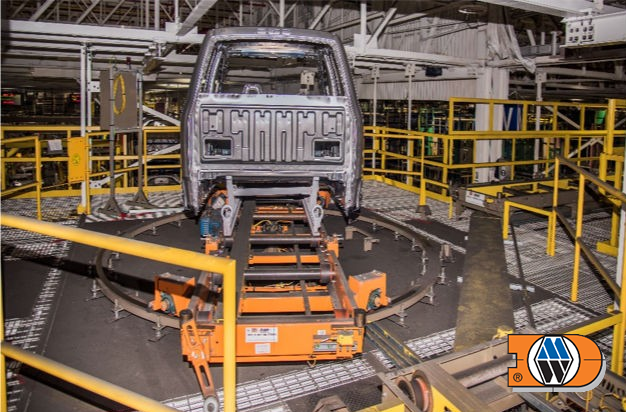 Loaded carriers conveyed on production centers may be completely purged from certain work areas and accumulated in a much smaller space. 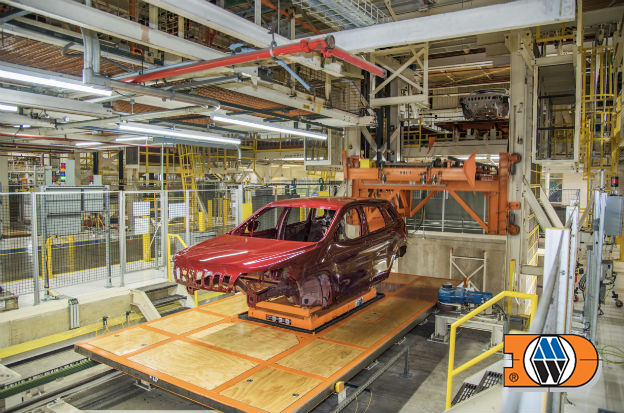 The carriers can then be allowed to re-enter the production process in sequence, if required. The accumulation feature permits high-density storage, which can be used for storing empty carriers when not in use, creating product sortation and sequencing banks, or storing product in production surge banks. 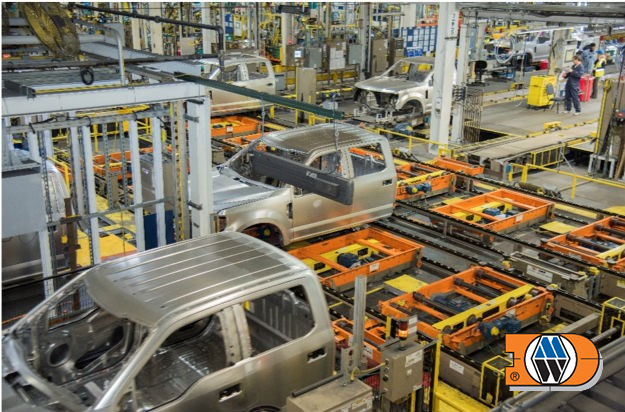 Sophisticated systems can be created using multiple chains to transfer carriers with product throughout the plant from process to process. 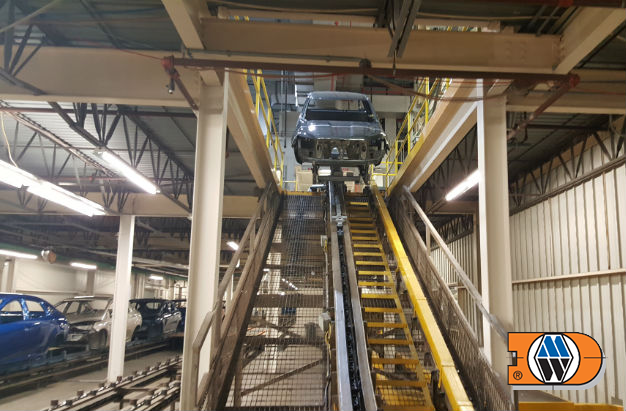 A P&F conveyor is an inherently simple and reliable method of transporting products. A minimal basic maintenance program will result in many years of trouble-free service. Special attention must be paid to monitor the maintenance needs of the load-carrying free trolleys. 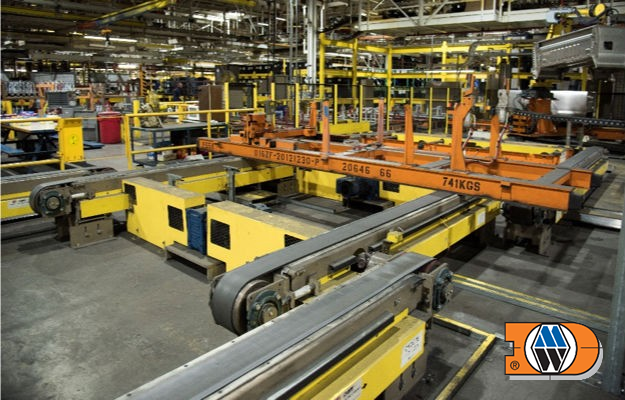 These trolleys are vital to the proper functioning of the conveyor system. The free trolley’s moving parts must be maintained for proper accumulation to occur. 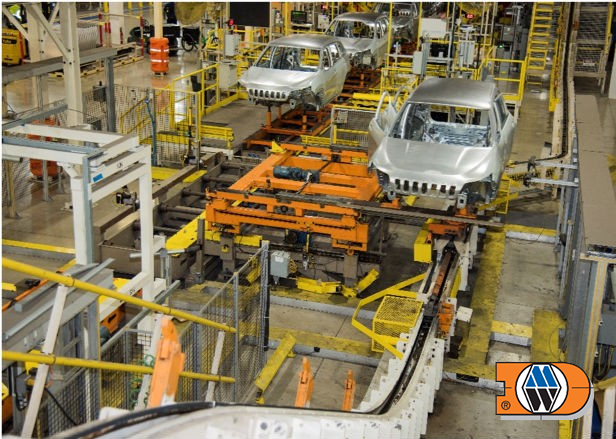 The load and side guide wheels and trolley pivot points all require regular lubrication to prevent premature wear. 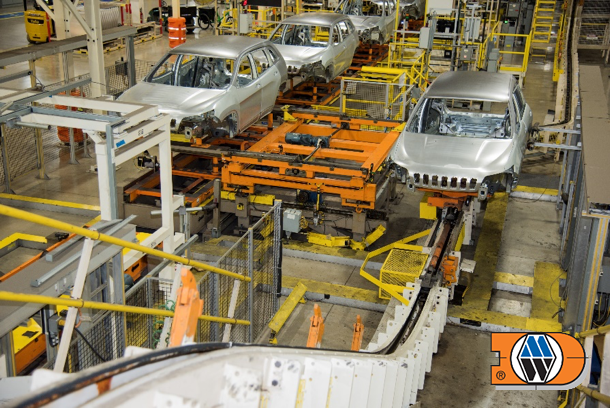 For ease of maintainability, P&F conveyors are typically equipped with automatic lubrication systems. 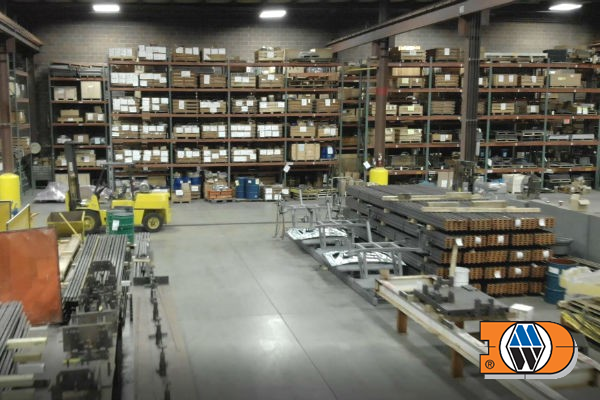 OHPF conveyors suspend products below or to the side of the power source, workers do not normally come into contact with any of the components of the drive mechanism. 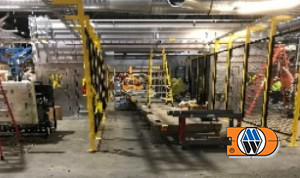 The continuously-moving power chain and the load carrying trolleys are elevated away from the normal traffic flow on the work floor; only the product and its carriers are positioned at working height. 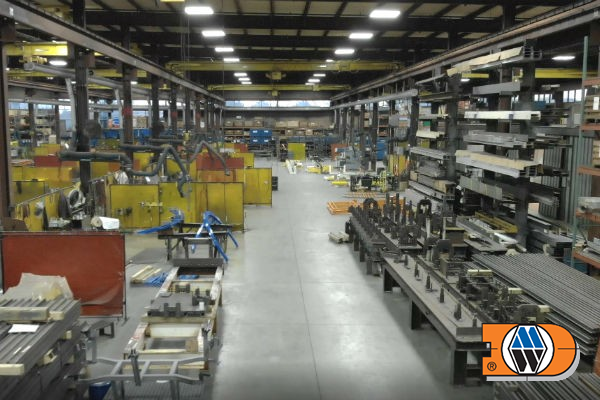 The products being conveyed through the production area are set at a pre-determined spacing and speed, which maintains adequate clearances between the moving products. The accumulation of products and empty carriers usually takes place in high-density storage areas located away from traffic flow (To maximize building cube or space availability, this accumulation often takes place overhead). 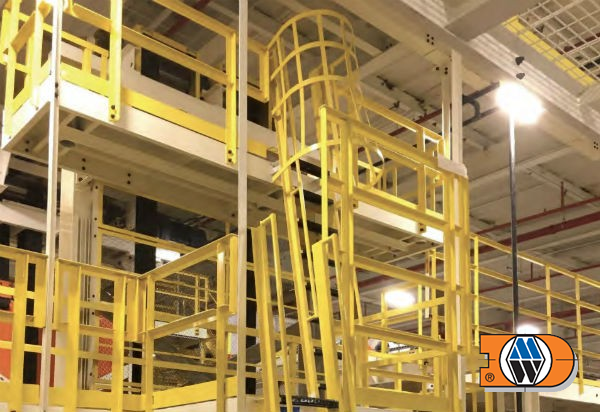 To protect workers from a falling product or debris, safety guarding is typically installed beneath the elevated portions. In addition, drip pans are often installed in certain areas to catch excess lubricant, dirt and dust. In OHPF conveyors, the powered track is above the free track, and the carrier is suspended from the free trolleys by means of load pins. This configuration, with the product suspended below the P&F track, offers excellent product access. 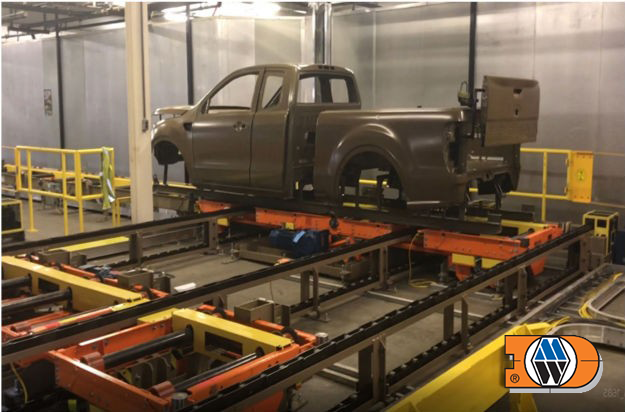 This ease of access enables workers to perform many different types of operations, whether the products are moving or stationary. DMW’s OHPF systems are essentially comprised of two standard product lines – 4″ OHPF and 6″ OHPF. As the name suggests, the IPF conveyor is located below the conveyed product. The product is mounted on a pedestal type carrier allowing virtually 360 degree product accessibility and is ideal for operations involving automation interface. 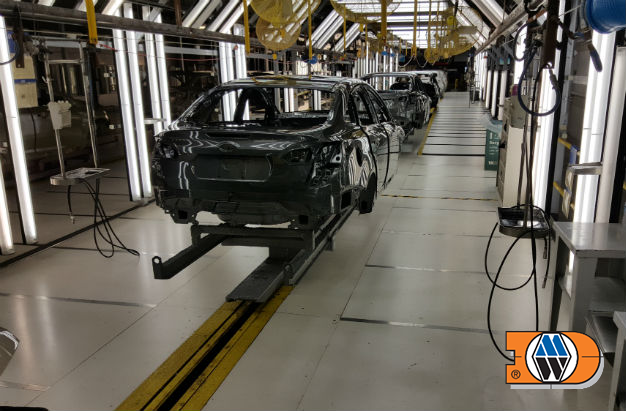 With the conveyor underneath the product, the danger of debris and contamination falling on the product is eliminated. IPF can be on the floor, flush with the floor, or elevated as required. When the conveyor is installed flush with the floor, the conveyor chain, trolley, track, etc., are protected from debris and contamination by means of a reinforced, overlapping, flexible, thermoplastic polymer seal. The seal does not deter the efficient operation of the conveyor. An Automated Electrified Monorail (AEM) is an overhead conveyor monorail system in which each carrier is equipped with its own electric drive and controls, making it self-powered and propelled. Conductor bars mounted on the track supply electric power to the individual carrier’s motors, as well as control and communication data to its control panel. 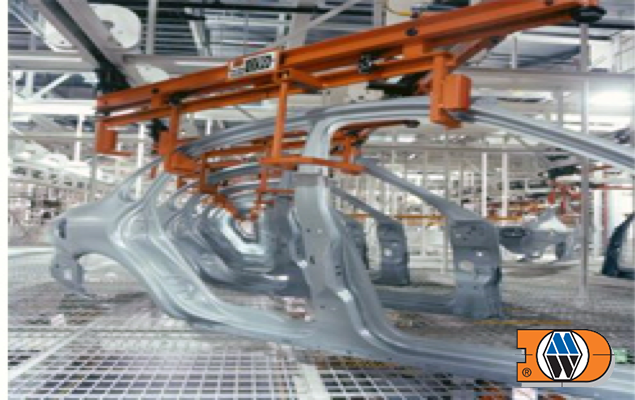 DMW’s AEM track is made of extruded high strength aluminum. 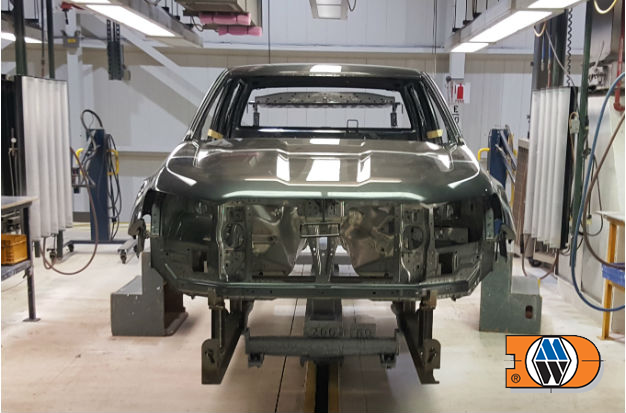 Aluminum is clean, light weight, and dimensionally accurate. 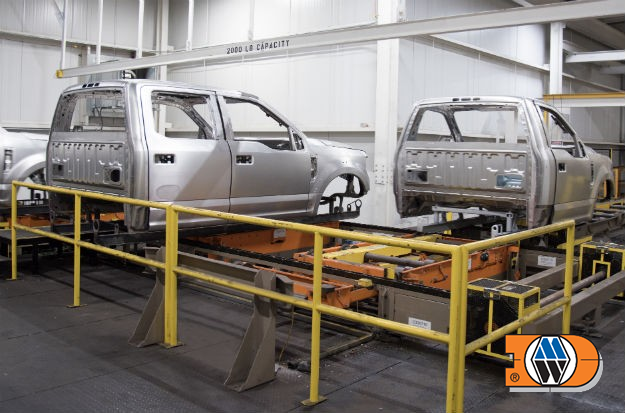 Precision drilling and cutting are made easier, with the use of aluminum. 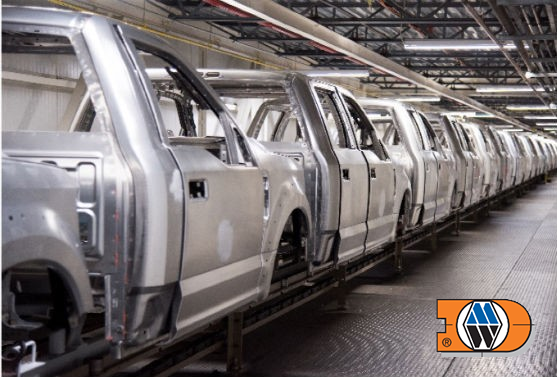 DMW’s AEM systems have the ability to operate at a wide range of speeds from slow to very fast, and they can precisely control acceleration, deceleration, and braking. 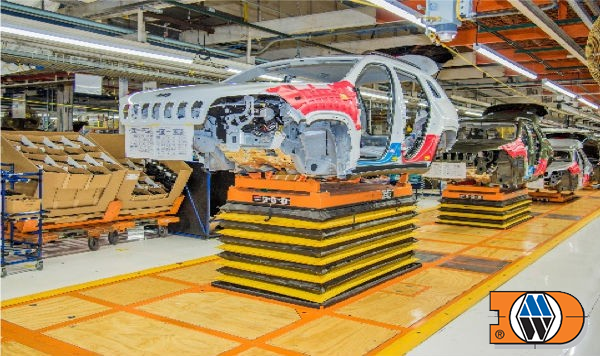 The AEM’s greater flexibility of speed and controls bring performance advantages to transport applications and to assembly operations. AEMs also perform well in buffer and storage applications. 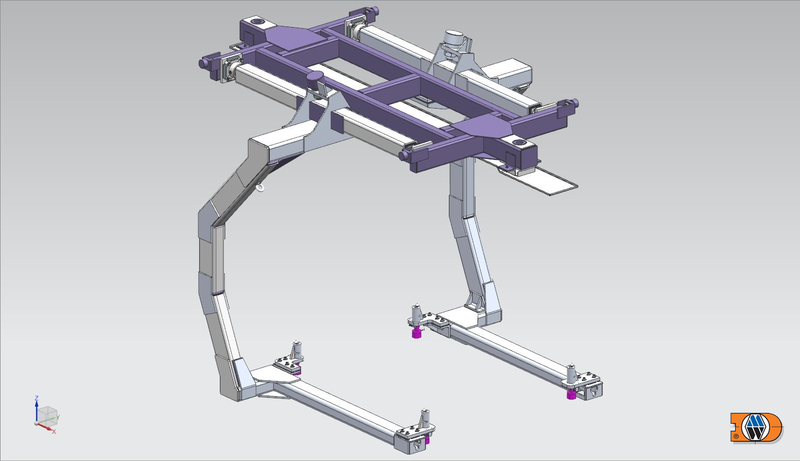 DMW’s 180 mm AEM system can carry loads up to 2400 lbs. (1090 kg), using tandem trolleys on monoplane systems. The load capacity of the system is dependent on speeds, angles of inclines, and the number of tractors used. 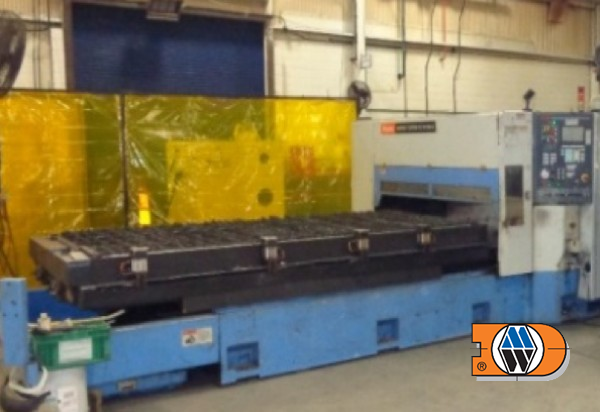 DMW’s 240 mm AEM system can carry loads up to 15,650 lbs. (7114 kg), using tandem trolleys on monoplane systems. As with the 180 mm system, the load capacity of the system is dependent on speeds, angles of inclines, and the number of tractors used. Cross-chain (X-chain) transfer conveyors are used together with lift- and hold-tables to transfer skid/pallet to/from adjacent conveyors on a horizontal plane in a cross-wise orientation. Cross-chain conveyors can be mounted above-floor or flushed to the floor. These are classified into 2- or 3-strand configuration. 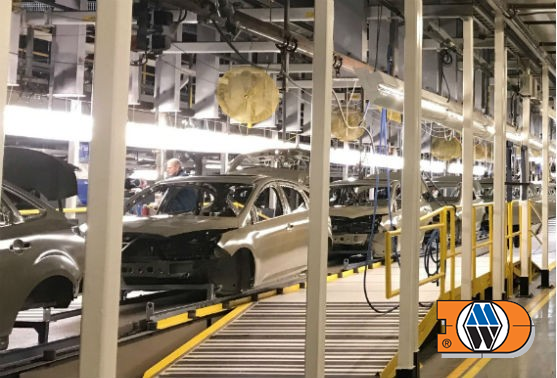 Accumulation on X-chain conveyors is accomplished by stopping the skid/pallet on lift-/hold-tables and, where layout conditions allow stopping directly before a lift-/hold-table on the conveyor chain. 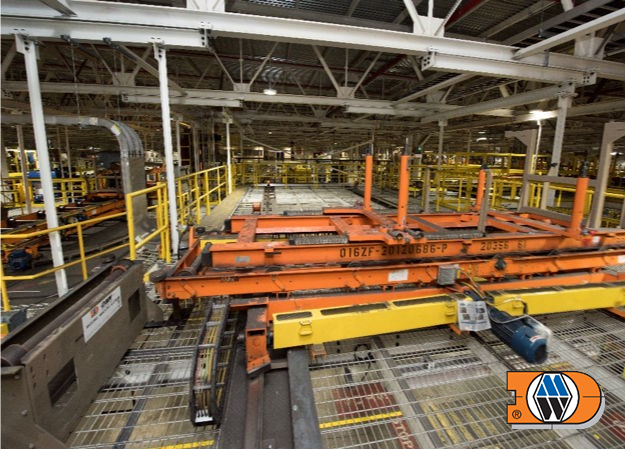 Only one skid/pallet unit shall stop directly on any given X-chain conveyor at a given time. X-chain conveyors transporting various length skids/pallets require a three-strand configuration. 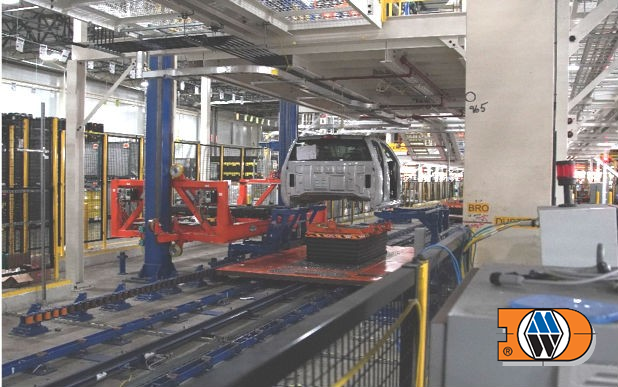 All three-strand X-chain conveyor track assemblies at lift-/hold-table locations are designed utilizing bolted construction to be easily removable for maintenance access. The drive assembly is located at the head, or discharge end, of the X-chain conveyor. For above-floor X-chain conveyor applications, the conveyor chain shall be CC-5 chain with UHMW roller, and CC-5A chain with steel roller shall be used. The X-chain transfers are typically modular in design. 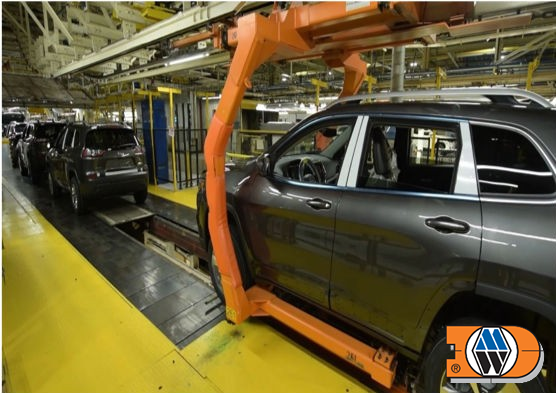 However, variety of combinations can be developed which provide flexible, reliable and efficient product mobility in automotive assembly plant. 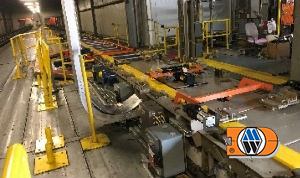 Cross Belt transfer conveyors are used together with lift and hold tables to transfer palletized units to/from adjacent conveyors on a horizontal plant in a cross wise direction. 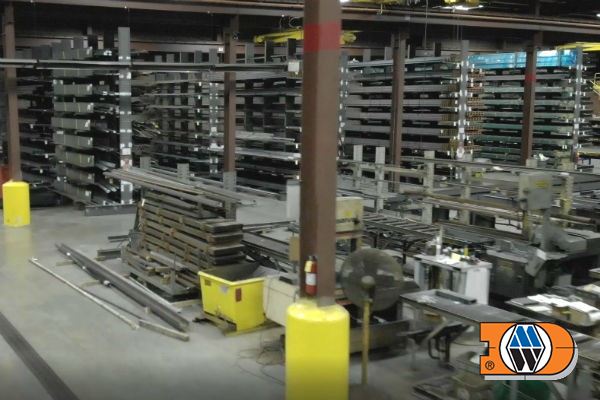 All X-Belt conveyors are installed above the floor and/or mezzanine and are two 2-stand configuration. Shuttle cart conveyors may be used in lieu of short travel X-belt and X-chain transfer conveyors. The maximum loaded shuttle cart transfer speed is 214 FPM (nominal). 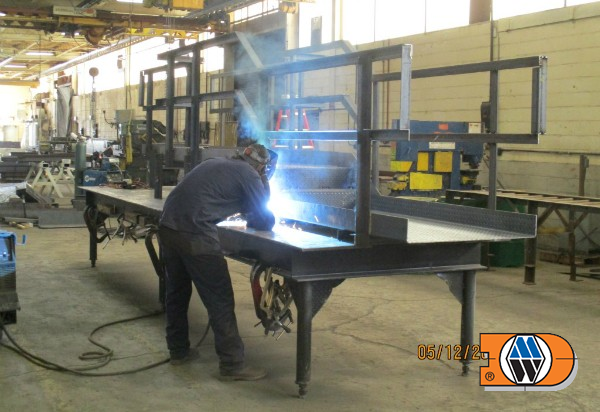 The shuttle cart conveyor is constructed from a formed steel base frame with integrally mounted end-trucks, PRB frame and transfer track assemblies. 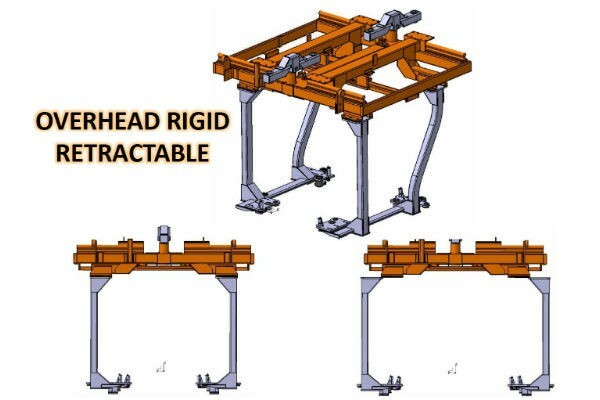 The PRB is bolted to the shuttle cart base frame utilizing clip angle connections that allow shimming to ensure a plumb, square and level installation. 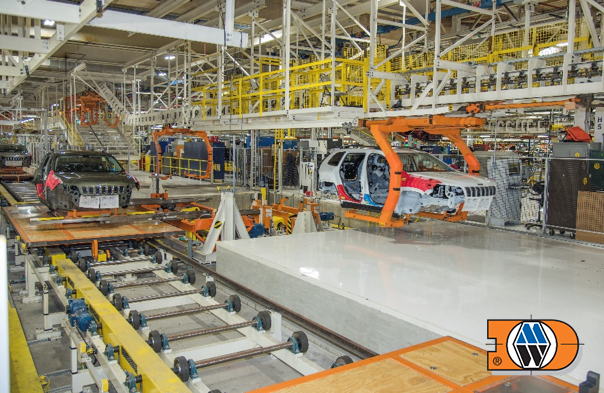 Lift- and hold-tables are used with cross-transfer conveyors to provide accumulation and transition between cross-transfers and the adjacent charge/discharge conveyors. 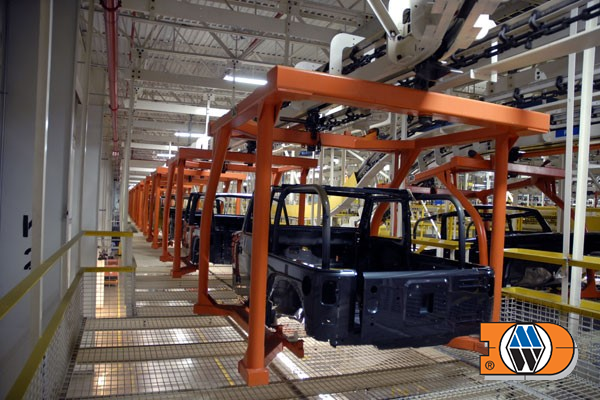 Lift- and hold-tables are constructed from two major sub-assemblies: (1) a base frame and (2) a lift frame. 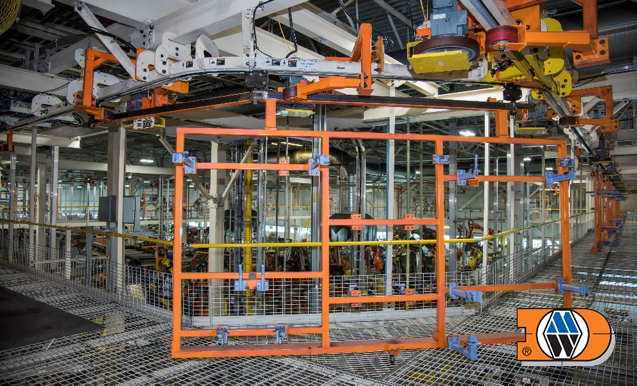 These frames are assembled using formed steel shapes and plates and may be bolted or welded construction. 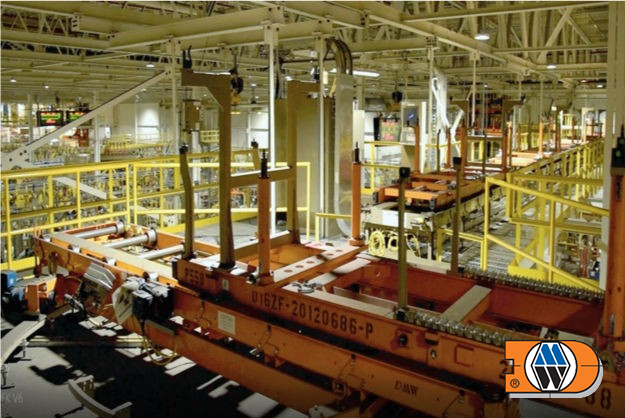 Lift- and hold-tables consists of “eccentric arm” lifting design and chain driven Power Roll Bed which allows the system to transfer skid/pallet carrier on to the next conveyor line. The base frame shall incorporate cam followers assembled to shaft mounted eccentric arms. The eccentric lift arm shafts shall be supported by pillow block mounted anti-friction bearings with jack bolts and shim pack for proper lift belt installation and alignment. 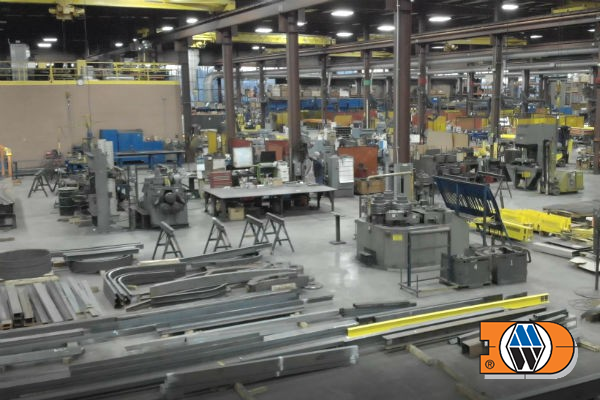 The design is efficient, reliable and robust to adapt any complex assembly plant layout. 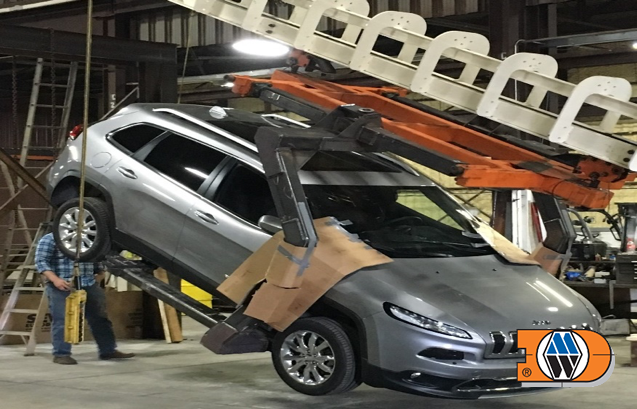 The lifting and lowering action shall be accomplished using an integral electric gearmotor with “fast acting” brake. 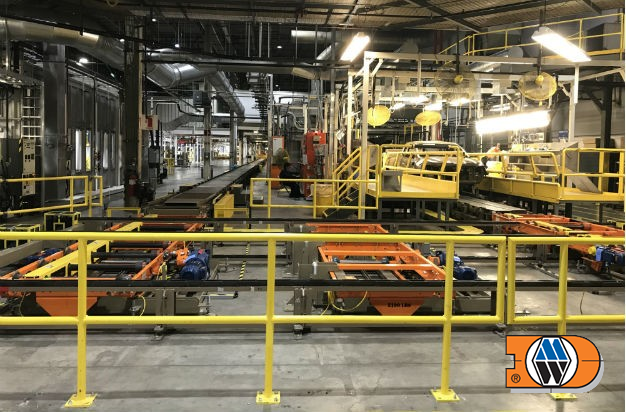 Although the Lift and Hold table add flexibility to any standard conveyor, they offer the greatest benefit when they are equipped with floating stops and proximity switches to sense and control the degree of travel. 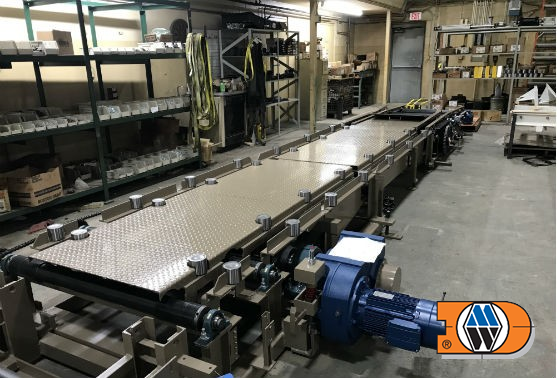 Turntable conveyors are used to change flow direction or product orientation when transferring a single palletized or skidded unit on a horizontal plane. Turntables may be “end pivot” or “center pivot” configuration. DMW’s Turntable Unit consists of one rectangular frame that is driven on a circular track (1800)/semi-circular (900). The rectangular frame has four roller wheels powered by one drive. 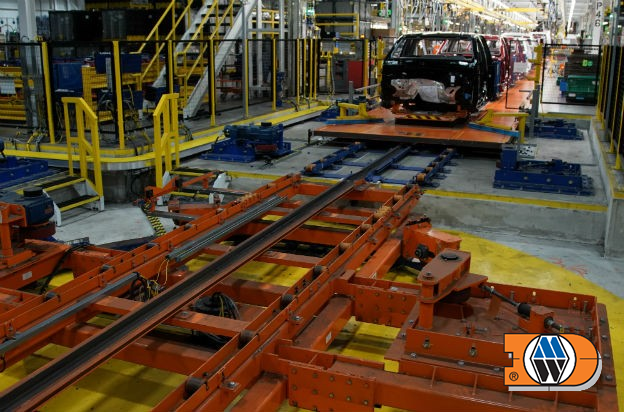 The powered rollers on the circular track will allow skillets to stop and change direction of flow in an assembly line with the ease of a 1800/900 rotation, allowing for the lead end of a skillet/skid to be re oriented during travel. 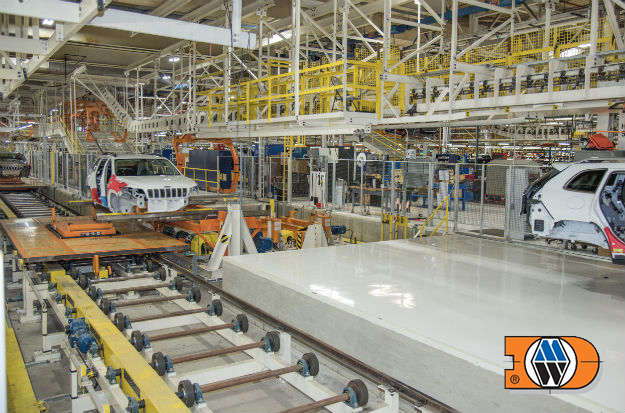 The 1800/900 ability of the skillet/skid reduces the need for additional equipment which by nature may take up valuable floor space in a typical assembly plant. Turntable transfer applications are highly recommended to minimize space and material used. 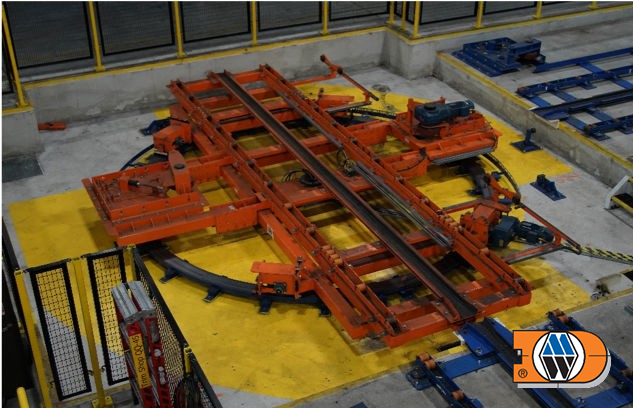 The turntable transfer provides its function in any point of an assembly line were a product change in direction is required as the roller wheels can go forward or reverse. 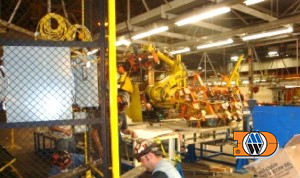 Automatic lift and transfer devices, commonly referred to as “Fork Transfers” are designed to not only transfer loads vertically, but to also move them horizontally. 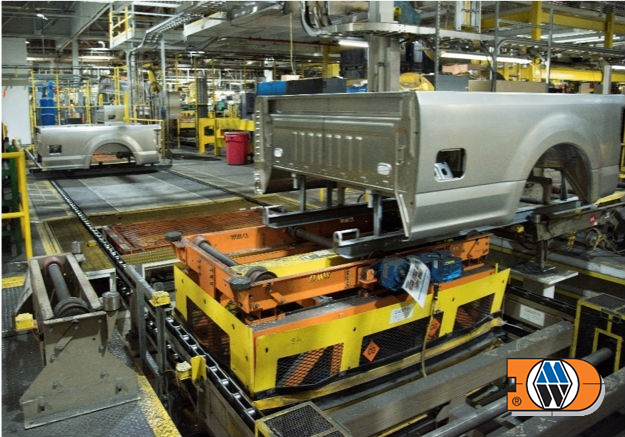 Fork Transfers can accommodate virtually any unit load, but their load capacity is limited to approximately 2000 lbs. The load limitation is due mainly to the low-profile design of the forks and the cantilevered position of the load. 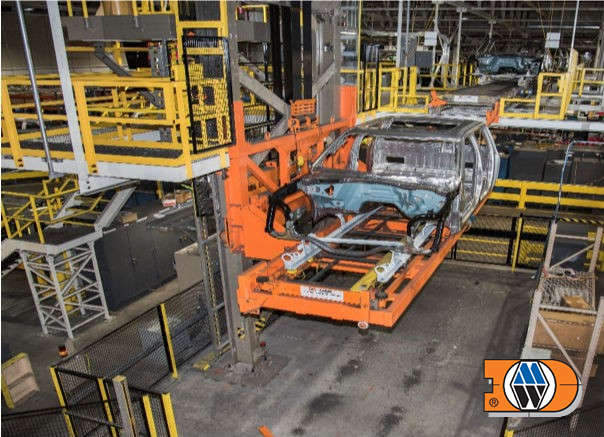 Fork Transfers equipped with telescoping forks can move a load from one conveyor to a home position and onto another conveyor. 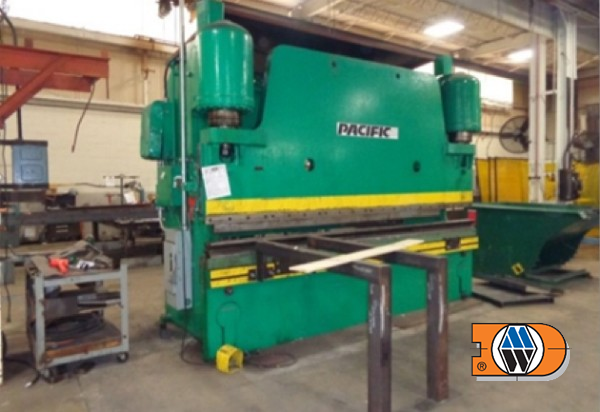 A telescoping fork is a precisely machined steel rack-and-pinion device that can move loads horizontally from the center about 7 ft (2.1 m) in each direction. Two or more forks may be used in tandem, depending on the load size and weight. Specially designed perches help to ensure that the load is carried securely and accurately during the transfer cycle. 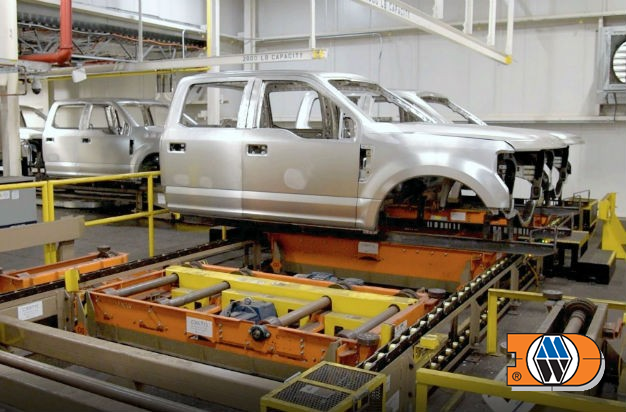 By offering both horizontal and vertical movement, Fork Transfers add a great deal of flexibility to manufacturing processes. In some applications, the precise horizontal and vertical travel of a fork transfer may make it the only practical handling solution. Aisle Crossing-Dual Strand Chain Conveyor is to convey skillets at increased speeds in effort to create an aisle between parallel conveyor lines. The conveyor chain is indexing CC-5A which is capable of withstanding the forces applied by all aisle traffic in the dynamic load condition. The flush-floor mounting configuration shall provide smooth traffic path. 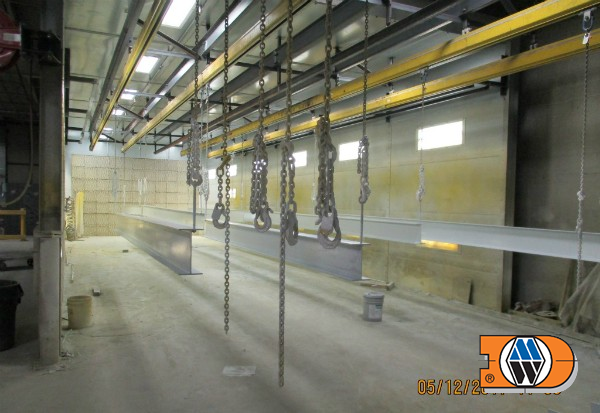 Support steel and cover plate – shall be provided integrator contractor – mounted to the conveyor and pit curb angle, at the aisle crossing(s) and shall extend a minimum of 2 feet (610mm) from the head/tail frame concrete pits line. 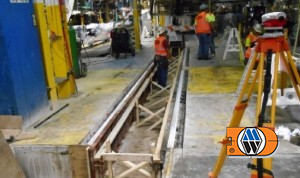 The framework and cover plate at the aisle crossing(s) must withstand the forces applied by all aisle traffic. 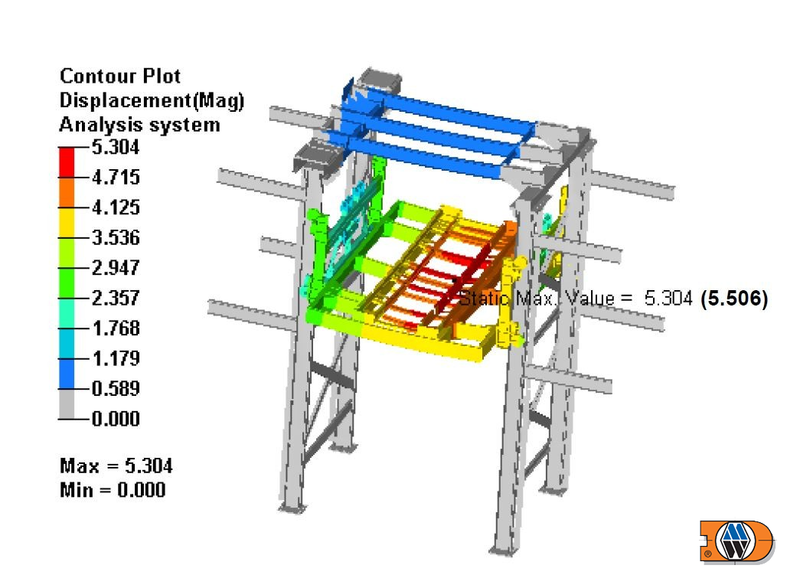 The module consists of the (2) Head frames, (2) Take-up frames, (2) middle tracks, (2) indexing chains and other components. 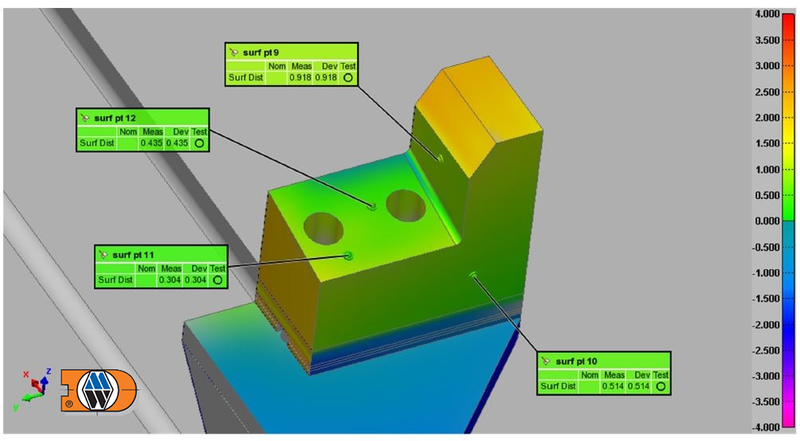 These main assemblies and components are shown as representations on the basis of functional criteria and only partly reflect the actual construction shown in the design drawings. 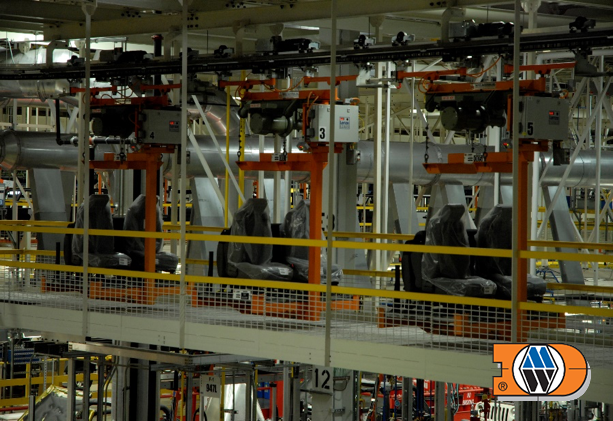 DMW’s Skillet systems consist of individual skillets that are “pushed” by friction drives at the beginning of the assembly line. Each skillet serves as a moving work platform. The product is supported on a scissors lift table, which is an integral part of the moving skillet. The adjustable height of the scissors lift table allows the operator to set the table at the most suitable and ergonomically correct height. 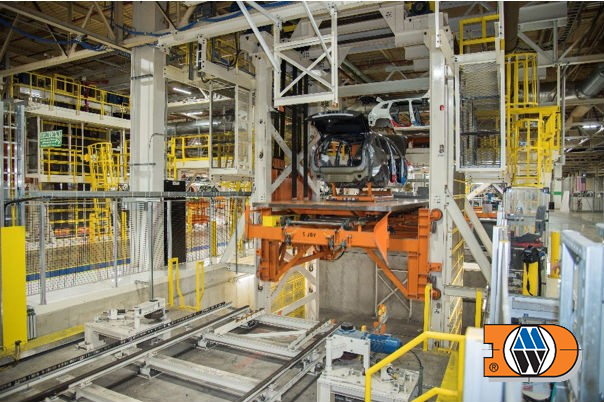 The moving skillet reduces the operator’s walking distance and all required assembly work is accomplished without stopping the conveying line. This, combined with reduced operator fatigue, results in increased production efficiency. 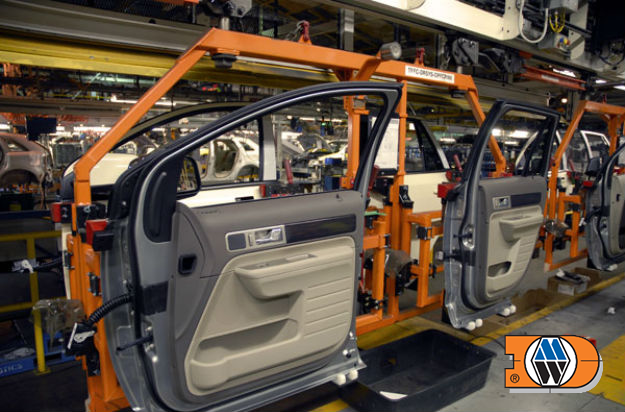 Skillet system applications are highly recommended for Trim and Chassis line operations. 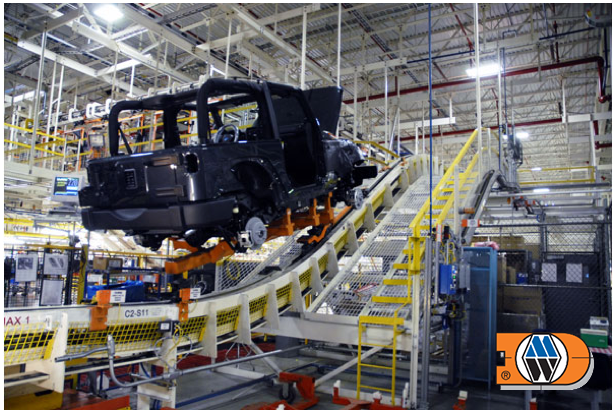 The large skillet size and integrated scissors lift provide 360-degree access for assembly operation of the product. 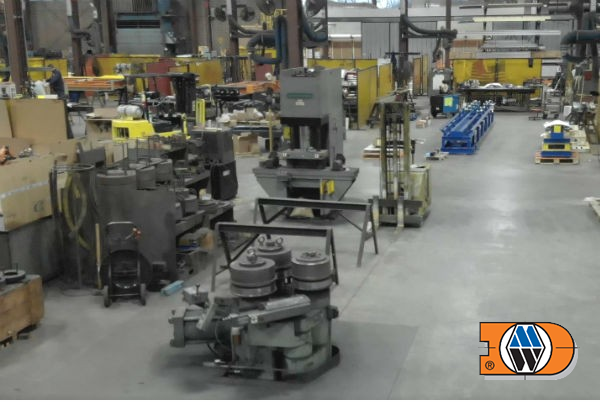 The drive system is clean, efficient, and eliminates the need for heavy duty conveyor chain, thereby reducing the Plant’s maintenance and chain replacement costs. 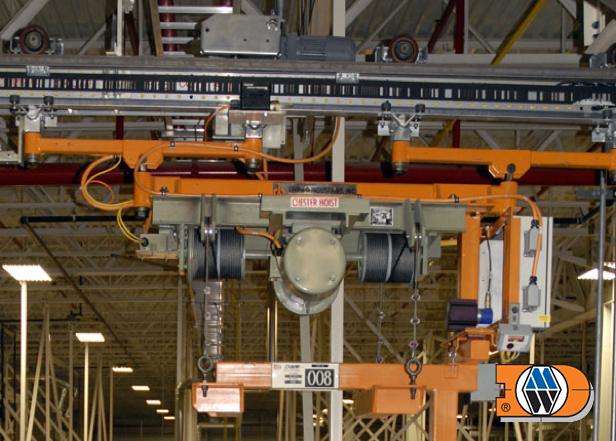 Flat Top conveyors can be single-strand or two-strand chain depending on the application. 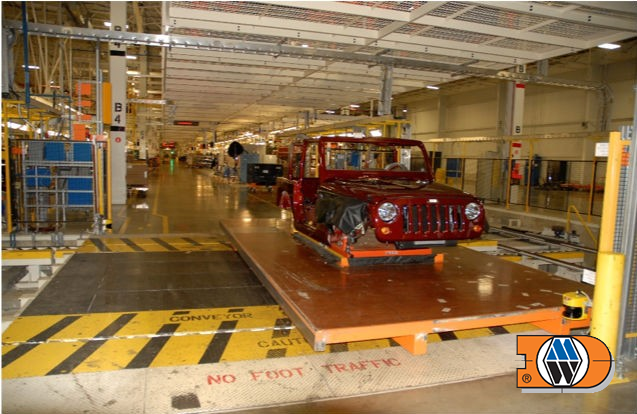 A Flat Top conveyor is installed flush with the assembly plant floor. The conveyor tail end, head frame support, drive, and return chain are enclosed in a pit. 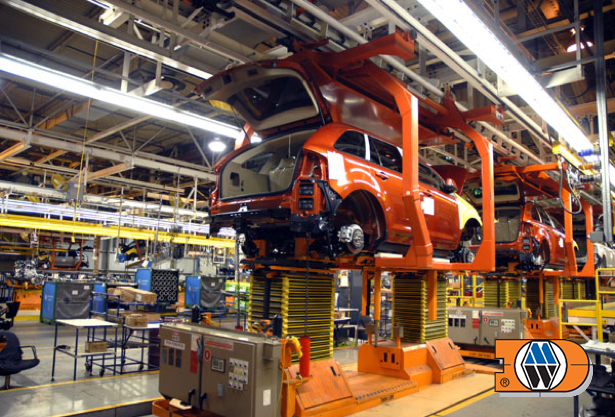 Flat Top conveyors are used in final assembly lines and water test booths. As an alternate to chain and flat top plate, DMW can also furnish belt type flat top conveyors. 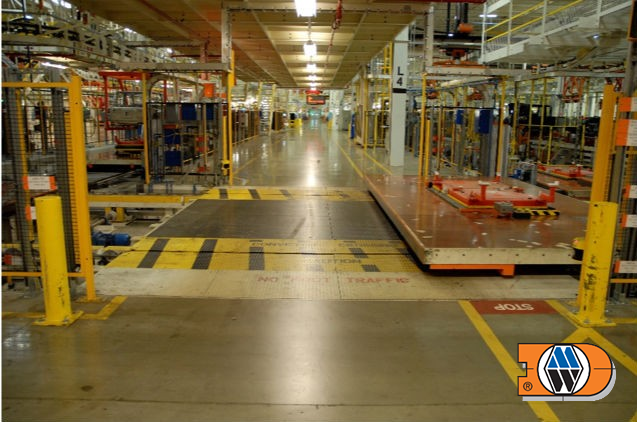 Belt flat top conveyors can be provided as single lane or dual lane configurations. 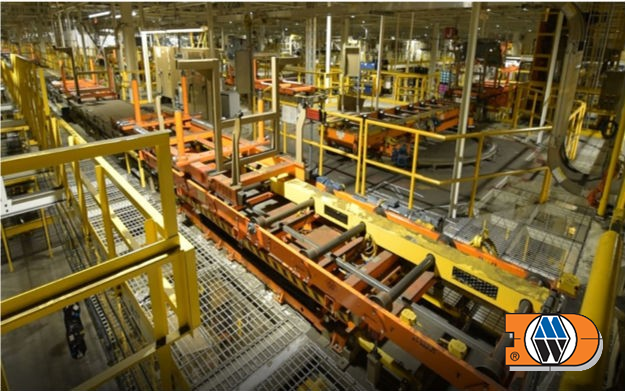 These conveyors can be several hundred feet in length. The belts are approximately ½” thick and are made of rubber with embedded steel cables. The steel cables add strength to the belt and reduce stretch. The underside of the belt has a fibrous material cemented to it in order to reduce the co-efficient of friction, which in turn reduces the horsepower required to power the conveyor. The conveyor slider bed can be either specially treated hardwood, mild steel, or stainless steel. 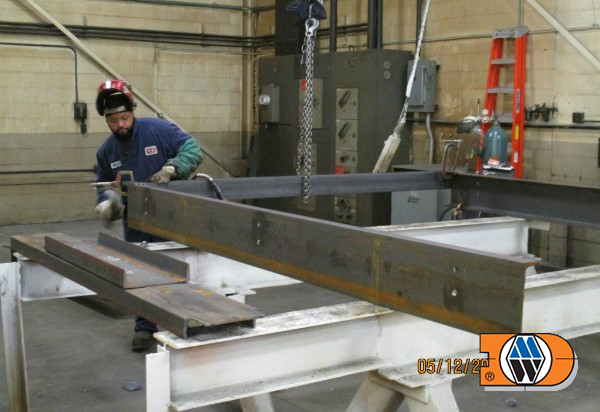 The conveyor belt is returned on steel tube gravity rollers mounted in the fabricated frames of the conveyor. The combination of a conveyor using rubber belting and stainless steel slider beds is ideal for wet applications. 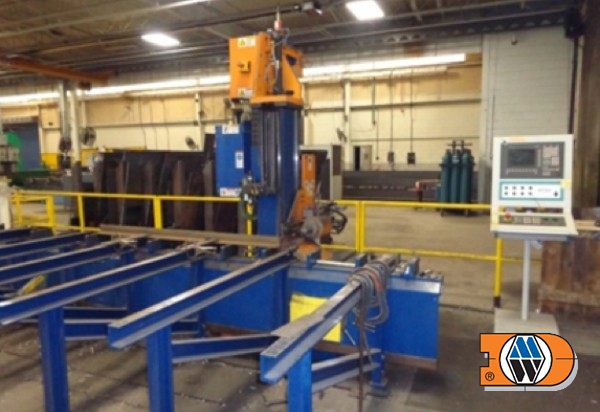 Power roll Beds are used to transfer a single skid/pallet/skillet unit on a horizontal plane. Power roll beds are equipped with rollers (Steel/Urethane) driven by a live chain and sprockets connected to a gearmotor running at pre determined speed to match required cycle times. The center to center distance between the rollers, is determined in such a way that the bottom flat portion of the pallet or skid rail is always supported by minimum of three rollers. Power roll beds are modular in design, and are typically designed based on type of conveyor or application. 2-strand roller flight conveyors are used when large batches of product are required to accumulate until it clears the conveyor traffic/meet production cycle time. Roller flights typically consists of Head Frame, Tail Frame, Drive Base, CC5 Sprocket and pneumatic stop assembly. Roller flight conveyor is equipped with raised roller incorporated into CC5 chain geometry to allow seamless movement of chain. when required pneumatic stop on head frame holds the product in place, so allowing the accumulation process. The conveyor is driven by Gearmotor connected to different sprockets to allow smooth entry/exit and connected to a CC5 chain sprocket which drives the entire conveyor. 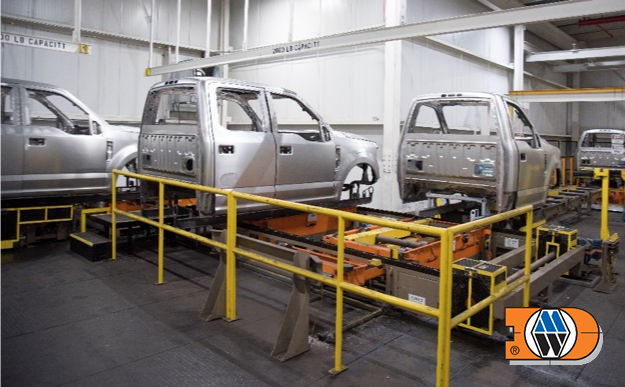 2-strand Production conveyors are used on production line especially in Paint and Body shops. 2 Strand Production conveyor typically consists of Head Frame, Tail Frame, Drive Base, CC5 Sprocket and Speed up section, if applicable. The conveyor is driven by Gearmotor connected to different sprockets to allow smooth entry/exit and connected to a CC5 chain sprocket which drives the entire conveyor.